Alec asked to go to the Ecotarium yesterday. We hadn't been in quite some time and they had a "new to us" exhibit called Alice In Wonderland that I've been wanting to go check out with them so I said sure. On the ride they used their color by number books and we listened to another book in the series The Pain and The Great One by Judy Blume called Cool Zone. Like always, the boys really enjoyed these funny stories and before we knew it we were at the Ecotarium. It was pouring rain when we left our house but it had just about stopped by the time we arrived so we were able to walk around and check out some of the outdoor exhibits before going inside. The kids were thrilled to find the otters sound asleep, so happy to find the bubble center set up just outside the entrance, and very excited to find a new Koala maze too. Alec took a long time to go through the maze since he stopped to read every single sign (like I knew he would!). We skipped the first few floors and headed right to the Alice in Wonderland exhibit. The kids climbed through the rabbit hole and we eagerly checked out all the optical illusions and fun hands- on learning opportunities. We observed the density of various liquids by watching air bubbles rise through water, oil and syrup. We got to smell a variety of different teas; the boys didn't find all that many that they'd be willing to try. Using an interactive globe the boys were able to see where they would end up if they dug a hole through the Earth from various starting points. They made silly sentences using a sentence builder and played with a spinning top where the pictures appeared to move and change. Sentence builder-- fun with words! We then looked in all the door peepholes and keyholes of the shrinking hallway and saw a variety of different things-- our own eyes staring back at us, the Cheshire cat, the weather outside, and many more. We played with lights and mirrors and watched the Cheshire cat disappear. We played golf with the queen and experimented with trajectory, friction, angles and shapes. It was a fabulous display and the boys didn't find it "too girly" or "too babyish" like I had feared. Light and mirror illusion makes the Chesire cat disappear! 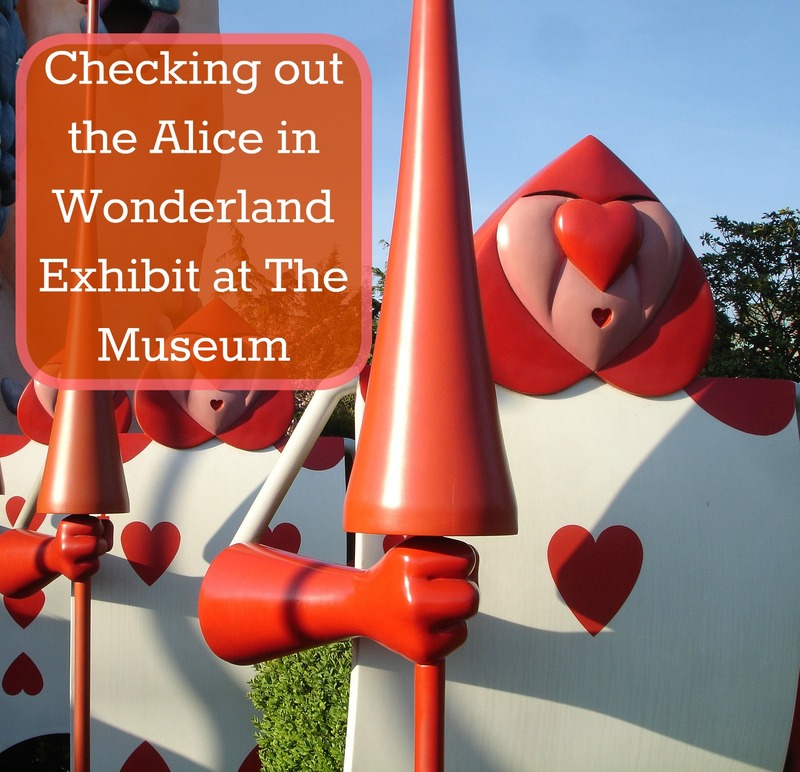 Once we were done with the Alice in Wonderland Exhibit, we made our way through some of our favorite exhibits. Along our exploration we stumbled upon a perpetual motion machine that kept us entertained for quite a while watching all the different balls move around and set off all the different components. We checked out the live animals and the boys took turns guessing how much water we use to make such things as a loaf of bread, a pair of blue jeans, a newspaper, a can of soda or a car (in case you're wondering it takes 16 gallons of water to make 1 can of soda and 500,000 gallons to make a car!). The turtles swam right up to us! We headed outside to see the live animals and we got to hear the foxes making noises and jumping excitedly onto the fence right in front of us! We practiced making more bubbles & learned all about the effects of lightening on trees. bubbled and boiled and the bark striped right off of it! "why is the water soapy?" Saying good-bye-- our last stop is always the otters!